MacBook Pro (MBP) is the Macintosh 13″, 15″ and 17″ Notebook Computers manufactured by Apple. MacBook Pro range was started on 10th January 2006 by Steve Jobs. The design of today’s MacBook Pro (MBP) is based on the design by Jonathan Ive for G4 PowerBooks by Apple. In 2005 Apple announced the shifting from PowerPC processors to Intel Processors. MacBook Pro marked the first portable Mac that had the Core Duo Intel processor. MacBook Pro is aimed primarily at the professional users. It represents the upper end of the MacBook series. Thus, the lower performance plastic housing smaller screen sized MacBook series was aimed at the consumer market, but MacBook Pro was designed to appeal to professional users as reflected by the aluminum case, Less pronounced branding, absence of any stickers, option of different sizes and various screen surface and technology beneath the glass cover. Most designs of a MacBook Pro is patented and each components are more precise, like the charger MagSafe2 which is currently used. Some components like this MagSafe2 is cross used with other devices from MacBook family. Third generation MacBook Pro means (eleventh in release count) Mid 2012 (June 2012 for 15″ non-Retina display and October 2012 for the rest) models. The MacBook Pro line is now divided into two groups : first in a 15″ MacBook Pro there is option with a high-resolution Retina display (2,880 Ã— 1,800 pixels) and the other non-Retina MacBook Pro 15″ with the previous resolution along with same 13″ model. Next to the display Retina and non-Retina line also differ in the thickness of their housing, position of the power button, absence of optical drive in non-Retina model, all solid state drives in Retina Model. All MacBook Pro third generation have an Intel HD Graphics 4000 graphics. The 15″ units have an additional NVIDIA GeForce GT 650M graphics card with 512 or 1024 MB of GDDR5 memory. All sports with 4GB or 8GB RAM and Intel core i7 Processor. MacBook Pro with 17″ display is no longer offered. Other new or changed features include a second Thunderbolt port, an HDMI port. FaceTime HD camera included as usually. 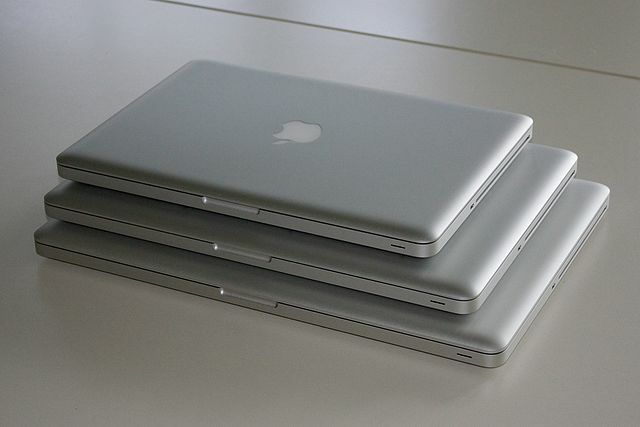 MacBook Pro 13" , 15" and 17" stacked one over another. There is no change in appearance of current model of MacBook Pro 13" and 15"
Current is the time of publication, January 2013. Although 15″ MacBook Pro with Retina Display, offers their highest technology, the steep pricing compared to non-Retina 15″, absence of Optical Drive, absence of Kensington lock slot, divided the traditional MacBook Pro users in to various opinions voting towards either MacBook Air or MacBook Pro 15″ non-Retina. This Article Has Been Shared 8986 Times! Cite this article as: Abhishek Ghosh, "MacBook Pro and MacBook Family : Brief Details," in The Customize Windows, January 27, 2013, April 25, 2019, https://thecustomizewindows.com/2013/01/macbook-pro-and-macbook-family-brief-details/.